Attached is our District 6 Crime Report for the month of February. Last month we were low again with 64 incidents and looking back over the last 3 years only March of 2017 and November of last year were lower than both months this year. That is really great news for our district! We know that our Northwest District IMPD does a great job, but credit does need to go to all of you as well. Having active Crime Watches, looking out for your neighborhoods, taking precautionary measures and following crime prevention tips, and calling 911 when you see something that seems suspicious all helps. Thanks for everything that everyone does to make our area safer. As Spring Breaks will be here soon, remember that many times when school is out crimes rise. Unfortunately many youth will act first and think later. Don’t make the temptations there. As I have been out in neighborhoods I have seen garage doors left open with nobody around, cars running in the driveway with no drivers, bikes and other toys outside, and other things that could make it easy for someone walking by to act without thinking. Look around today and is there something that you can do to keep a larceny or stolen vehicle from happening? Remember, too, do not leave anything of value or that may be seen as possibly of value in your vehicle. And always keep your vehicle locked. It is easy to open a door and grab something or go through a glove box. It does not take long to do a smash and grab either. Just a reminder, don’t leave garage door openers in vehicles, as you don’t want someone to have access to your garage or house. By all working together and following Crime Prevention Tips we can make our District 6 less desirable for those who may be looking to commit crimes. We will send a message that District 6 is not easy pickings and to go try somewhere else. I am sure we would all like to see even less crime in the area we live in. Please feel free to pass this information on to others in our District who may be interested and not already be receiving it. By being informed and aware everyone can benefit. If you see something or something does not seen right to you, call 911. That call could help keep a crime from happening or help to catch someone who committed a crime. If something has already happened call the non-emergency number (311 from a cell phone or 317-327-3811from a land line). 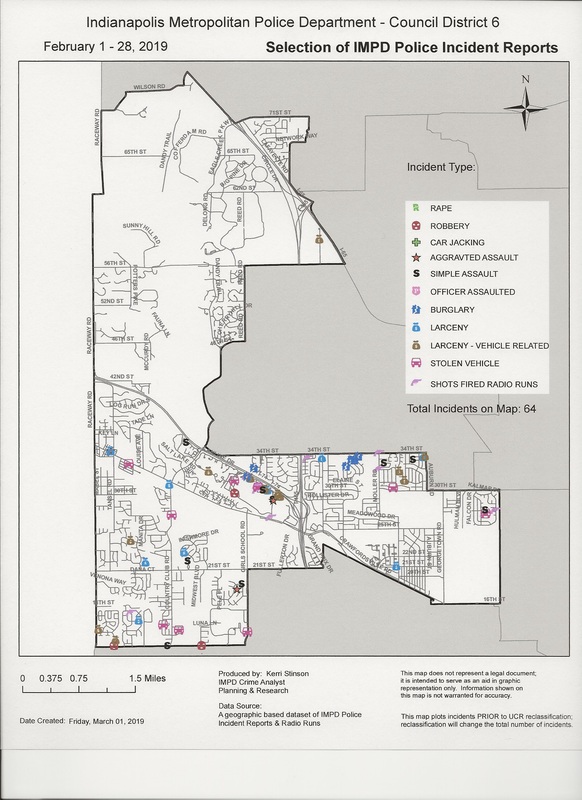 Do report all crimes as this may be helpful to IMPD in catching those who are doing it or preventing future crimes from happening.